Established in 2012 as Africa's first neutral Internet eXchange Point (IXP), NAPAfrica has grown seven-fold to become not only the largest in Africa, but one of the top three IXP's in the southern hemisphere, as well as the regional Internet traffic hub for sub-Saharan Africa. Lex van Wyk, chief executive officer, Teraco, home to NAPAfrica, says that NAPAfrica has made an undeniable impact and has forever changed the face of peering across the African continent. "It's never easy being the pioneer, but we believed in the notion of a neutral Internet exchange (IXP) enough to forge ahead and launch the exchange. It has grown immensely and built an impressive community of like-minded businesses that all understand and believe in the benefits of peering and interconnectivity," says Van Wyk. IXPs are widely considered to help develop markets, by lowering the cost of transit and are critical for bringing content closer to the consumer. IXP's like NAPAfrica, assist in managing the network challenges that arise from the introduction of so many new Internet applications and services. According to Van Wyk they play a critical role within a data centre by enriching the quality of the Internet: "There is also a rationalisation of the costs by balancing traffic with direct, and local relationships with participants. In addition, traffic delivery management is improved because data flows remain as close as possible to the destination, resulting in better performance and quality to end users." In its five years, NAPAfrica has worked successfully alongside Teraco, now Africa's largest data centre operator. 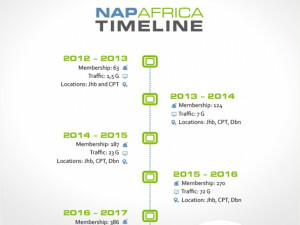 NAPAfrica's Johannesburg Internet exchange is one of the top 20 largest global IXPs by membership. Since its launch in 2012, it has grown to over 170 Gbps of traffic and 386 members, including the largest content owners such as Akamai, Cloudflare, Facebook, Google, Microsoft, Netflix, and Showmax. "In a very short space of time NAPAfrica's peering community have become a critical component of Africa's Internet eco-system, and we expect the growth to continue as a result of the community's investment into Africa's Internet infrastructure," says Van Wyk.